Chinese ecological conservation and restoration facilities in Yongshu Reef, Zhubi Reef and Meiji Reef of the Nansha Islands in the South China Sea went operational on Tuesday. 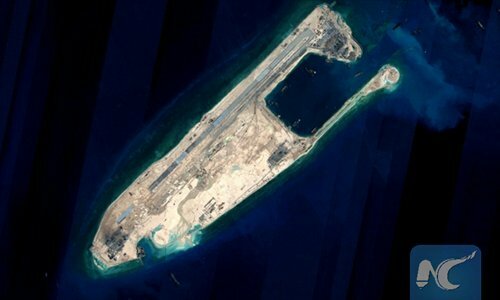 The goal of the facilities is to strengthen ecological protection in the South China Sea and to fulfill the responsibility of protecting and restoring the ecology of territorial space, according to the Ministry of Natural Resources, reported the Xinhua News Agency on Tuesday. The coral reef ecosystem is a typical ecosystem of the Nansha Islands, and protecting the coral reef ecosystem is vital to the ecological safety of the islands as well as the entire region, Xinhua said. The newly launched facilities will survey and evaluate the evolution pattern of the coral reefs in order to identify key areas that need protection efforts, the report said. The restoration will mainly be done by nature, but artificially aided. The methods applied will be according to actual situation and will be explored innovatively, as the staff of the facilities set up a technological system that is suitable the ecological traits of the Nansha Islands, Xinhua reported. The Ministry of Natural Resources has already launched marine observation centers in Yongshu Reef, Zhubi Reef and Meiji Reef. They are now providing public services including marine forecasts and disaster alarms to the international society and passing vessels. China has built three independent airports on the three reefs, which are designed to improve regional air transportation services and were put into use in 2016, Xinhua reported. China has also built lighthouses on Huayang Reef, Zhubi Reef, Yongshu Reef and Chigua Reef, China News Service reported in October.